You may be wondering what is so special about temperature sensor because all phones these days have some kind of temperature sensor that monitors temperature of battery and CPU. As a matter of fact, you are right. But here we are not talking about the sensor that keeps an aye on the temperature of CPU and battery. By a temperature sensor we mean a sensor that can tell you the air temperature or ambient temperature, to be exact. When we explored in detail to get the idea how many Smartphones come with a temperature and we were surprised to know that still a temperature sensor is not a common feature in Smartphones. Among the myriad of smartphones, only 4 or 5 are equipped with a temperature and humidity sensor. Samsung, a de facto pioneer in the field of technology launched its first temperature sensor phone Galaxy S4 in 2013. This sensor could be accessed through S-Health. The then flagship phone of Samsung Note 3 followed suit. But it's quite inexplicable that after that no Samsung phone was launched with a temperature sensor. Almost every device has an internal temperature sensor which monitors the CPU and battery temperature of device. Now if there is another temperature sensor to measure the air temperature, it should be implanted far enough from the battery and CPU and also should be on the outer side of the device. Even such measures are kept, we cannot rule out the possibility that its reading would be affected by the overall temperature of the mobile. It would be hard to get an accurate ambient temperature. And It should be the reason that not every Smartphone has such a sensor and even Samsung stopped equipping its devices with a temperature monitor. 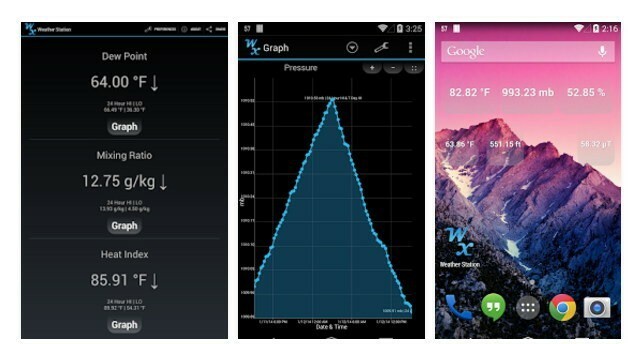 S-Health app of Galaxy S4 and Note 3 has clear directions about the use of temperature sensor that before you take air temperature with the device, you should let the device sufficiently cool off, put the device down on a stationary surface and not hold the device in your hand. These directions are there so that device is not heated up and the temperature sensor gives you an accurate idea of ambient temperature. After Samsung, Motorola fit temperature sensor in its two mobile phones. These mobiles were Moto X and Moto X Second Generation. But we are not sure how accurate their sensors are. I have an idea of how to have a thermo sensor in a smartphone: In Samsung Note series, the detachable pen could be converted into a temperature sensor, useful to measure either the body temperature, like a thermometer, or air temperature, like a thermo sensor. Because the pen is detachable, the thermo sensor would stay away from the heat generated by the battery’s phone, and therefore, accurate. I hope that Samsung’s technicians get this idea and develop it. So far, just one function, as a simple pen, is really a pity, a waste, for not exploiting all the possibilities it has, including to attach a microphone in the pen, for instance. James Bond would be happy with a device like that! I don’t see the need for temperature sensor but I also don’t understand why remove humidity sensor with it. Humidity sensor works great and its very useful. I’m 70 with multiple health issues. It is important that my room temperature remain no lower than 66 degrees. Can my Galaxy S-8 provide the room temperature? Absolutely not. it would be better to use a dedicated room temperature measuring device which is so much cheaper.